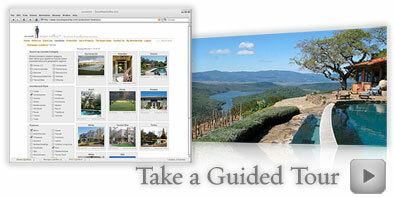 The Entire Napa Valley — at your fingertips. SEE IT ALL WITH A FREE 90-DAY TRIAL MEMBERSHIP. You know precisely the sort of location you're seeking — but whether you find it depends on the vision and knowledge (or lack thereof!) of your location scout. Until now. Scout Napa Valley® puts the power to choose in your hands. That’s because we open the doors to our entire Online Location Library of hundreds of Napa Valley properties. Using a powerful search engine unlike anything you've seen in the industry, you can sort through our gallery of thousands of images — ranging from vistas and interior shots to beautiful scenarios that will inspire exciting new ideas. Specify exactly what you're looking for — architectural style, geographical location, and even features like gardens, vineyards, fountains and fireplaces — and within moments your computer screen will fill with stunning visuals. The only difficulty you may have is choosing which locations you like best of all. And once you've found locations you're interested in, our intuitive LightBox capability allows you to store and share selected properties with the click of a mouse. So coordinating plans among your team is as simple as it is instantaneous. How does it all work? Our GUIDED TOUR will show you how easy it is to find the precise location you're looking for. Sound like the location solution you've been waiting for? Sign on now and see how speedy and inspiring scouting can be! The Guided Tour video requires Flash and may not play on iOS & Android mobile devices.